Nine people are confirmed to have contracted measles when they visited Disneyland in California in mid-December. Another three cases are suspected, according to state health officials who are investigating the outbreak. The California Department of Health said the nine people, including children, visited the park from California and Utah, and that it’s likely that a single person with measles visited during that period, exposing the other visitors. People near a measles patient could be at risk if they haven’t had the illness or two doses of the vaccine. The people diagnosed include children as young as eight months, and six of the nine confirmed cases involve people who were not vaccinated. One person who developed the disease was vaccinated. Measles is a highly contagious respiratory disease caused by a virus that is spread through the air via coughing and sneezing. There is no treatment for it except keeping the patient hydrated. The disease starts with symptoms such as fever, runny nose, cough, red eyes, and sore throat, but is followed by a rash that spreads all over the body, according to the Centers for Disease Control and Prevention (CDC). People diagnosed can also develop complications like pneumonia or diarrhea. The CDC said measles was eradicated in 2000 in the United States. That meant that no cases were reported for 12 months straight, but since then the numbers have been increasing when parents skip or space out vaccinations, or because of concerns that the vaccine is unsafe. In 2012, there were 55 cases reported; in 2013 there were 187 cases; and in 2014, health officials diagnosed measles in 554 people. Though a rare disease in America, measles outbreaks are reported in Western Europe, the Middle East and Southeast Asia. Paul Offit, chief of infectious diseases at the Children’s Hospital in Philadelphia, said in 1995 that an outbreak of measles in Indiana was started by a girl who visited Romania on a church mission trip. After her return, the girl attended the church picnic with 500 people and 31 got measles. 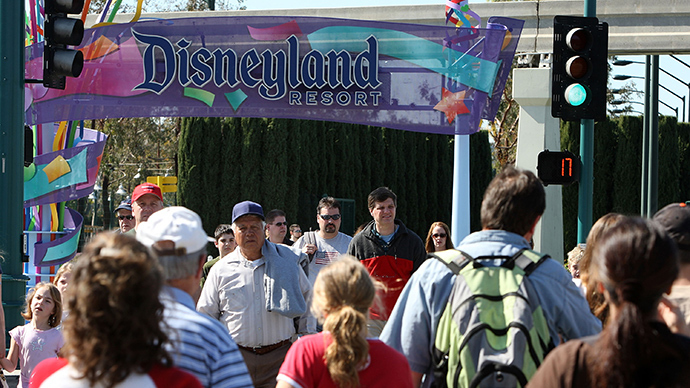 Disneyland, meanwhile, receives 16.2 million visitors a year and has over 65,000 employees. "We are working with the health department to provide any information and assistance we can," Dr. Pamela Hymel, chief medical officer at Walt Disney Parks and Resorts, told the Los Angeles Times.